Apple added or improved quite a few features in iPhoto ‘09, but one in particular hasn’t received much attention since iPhoto ‘08: keywords. iPhoto’s keyword tools for organizing your library offer some handy functionality, but they're hardly worthy of the power-user photographer. 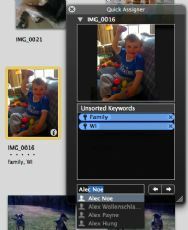 Whether you need some help wrangling your photo library or you’re a chronic organizer of memories and photo shoots, Bullstorm has updated its Keyword Manager plug-in for iPhoto ‘09. Keyword Manager is a powerful, streamlined tool for quickly adding keywords to your photos, then leveraging all that organization-fu for what it’s worth. A Quick Assigner panel allows you to add keywords (complete with type-ahead support and a preview) to your photos, and a keyboard shortcut lets you quickly skip to the next un-marked photo. A separate Keyword Manager panel lets you organize your keywords into hierarchies like “Family” or “Objects,” then filter your library and albums by one or multiple keywords at a time. Keywords can even be marked as different data types, such as “Person,” “City,” or “Location,” which gives them visually identifying icons in the Manager panel, though not much in terms of added organizational use. Of course, iPhoto ‘09 added the Faces and Places features, which may have satisfied many users’ needs to manually assign keywords to their libraries. But Keyword Manager still offers some advantages, especially when it comes to quickly tagging multiple photos, finding photos that have yet to be tagged, and turning keywords into an organized hierarchy. A demo of Keyword Manager is available, and it requires at least iPhoto ‘06 and Mac OS X 10.4 Tiger or greater.